The FF-117 is 1.4 MB. Larger files take longer to load. This is the FF-117 listing page, here you can download the plan, article and see the main thumbnail and extra images. 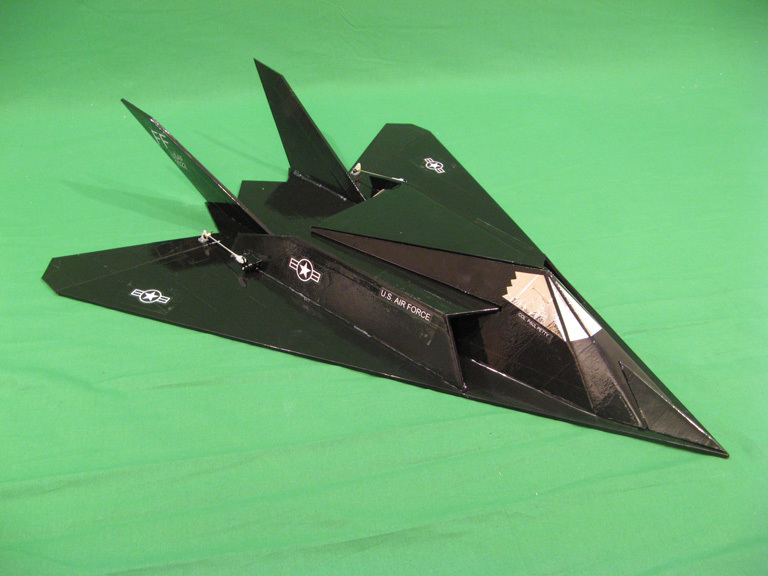 This RC model is loosely based on the F-117A Stealth Fighter used by the USAF. The original RC model design was made with Elmers Foamboard and covered with colored sealing/packing tape. Other materials such as Depron and Fan Fold Foam may be used to make this model. This is a design template for a high performance, high speed RC aircraft. This plane should only be built and flown by experienced pilots with adequate skill to fly fast, maneuverable planes. DO NOT fly this plane where it can endanger people, livestock or property. These are the details for the "FF-117" plan. If you would like to become a plan editor and help us to edit the attributes of all the plans in the website please click the "Edit Attributes" button below. Order your FF-117 prints today! The FF-117 plan can be printed on plain paper, tracing paper or polyester film and shipped worldwide. Scale: The original wingspan for this model is 34.5 in. / 87.6 cm. Please Change the values below to order in a different wingspan. This tool allows you to calculate the cost of printing and shipping the FF-117 plans and its building article if available. If you need to resize a plan please contact us with the ID:99050 and the desired wingspan. It has been downloaded 930 times. Donate directly to iubitahp2000´s Paypal account.